Gasoline Direct Injection (GDI) System Market size was over USD 3 billion in 2015, is estimated to grow at over 12% CAGR over the forecast timeframe. Increasing automobile demand, the advent of next generation fuel saving technologies, and regulatory mandates are the primary factors fueling the gasoline direct injection system market share over the forecast timeline. Growing requirements for increased fuel economy for cost-sensitive consumers has driven the demand for GDI system market size. Stringent regulations to reduce CO2 emissions and related fuel economy standards are likely to attract a huge consumer base. Amendments in these standards to further reduce the base lines of the fuel efficiency and GHG emissions will provide huge impetus to the gasoline direct injection system market growth. Technological advancements, such as integration of drive systems and controlled valve operation systems, to optimize fuel economy will influence direct petrol injection system industry growth over the forecast timeframe. High initial costs of the equipment owing to the required component complexity, ruggedness, and accuracy in manufacturing is hampering the overall GDI system market size. Along with these factors, several owners and automotive servicing personnel have reported increased engine carbon build up in the equipment, leading to blockage in fuel systems, and increased maintenance costs. Solutions to cater these problems lead to increased costs and demotivation of users, further hindering the industry growth. Moreover, alternatives available in the form of PFI systems that are considerably suitable for economy cars are likely to pose considerable threat to the gasoline direct injection system market growth. Electronic control units contributed the largest share in the GDI system market owing to its requirements for regulated control of the equipment. The other major contributors to the cost of the overall equipment includes fuel pumps, injectors, sensors and other components for better efficiency and advanced attributes. Injection manufacturers are adopting laser-drilled holes to achieve highly efficient combustion and reduce emissions. Laser-based manufacturing is associated with approximately 20% savings in the fuel consumption over conventional port fuel injection. This will also help in compliance with strict emission standards over the coming years. Demand growth rates of new automotive and repairs, is expected to fuel the overall gasoline direct injection system market share by 2024. Moreover, characteristics such as increased efficiency, compactness, light weight, improvement in fuel consumption and other engineered advancements are likely to draw in huge inclination of consumers. For instance, in 2015, products from Bosch presented its injection portfolio that incorporated turbocharging and a few other downsizing concepts, which reduced the fuel consumption and CO2 emissions by 15%. 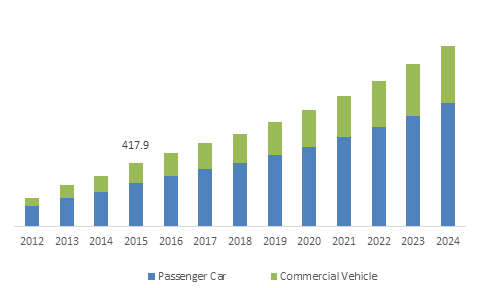 Growing disposable income has increased the buying power of the population, which has led to significant growth rate in adoption of passenger vehicles. China and the U.S. are among the top two countries with the largest passenger vehicle consumer base. This is likely to propel the GDI system market over the forecast years. Growing demand for commercial vehicles (CVs) for several purposes that includes transport and logistics, are likely to drive the overall gasoline direct injection system market growth. CV segment is estimated to register gains at over 12% CAGR, and account for more than 30% of the overall GDI system industry by 2024. Integration of advanced drive technologies and innovative components & methodologies for better operation & network capability, reliability and overall performance optimization are expected to provide huge impetus to overall gasoline direct injection system market growth. Moreover, increasing demands for transportation and logistics over the coming years will provide stable growth platform. Europe gasoline direct injection system market size accounted for over 40% of the overall industry owing to the high adoptions in the region. Development of regulations to reduce the emissions and their environmental impacts are anticipated to be the primary factors, that will continue to influence the growth across the region over the coming years. Asia Pacific is expected to grow at the highest CAGR over the forecast years, owing to potential growth landscape in the region. Economically stabilizing regions that includes China, India, and Indonesia are expected to present potential growth avenues owing to increasing automotive demand. Moreover, increasing concerns regarding pollution and GHGs will further fuel the regional GDI system market growth. Vehicle emission standards such as Euro 5 in EU to control fuel emissions and regulations imposing fuel economy mandates such as CAFE standards in the U.S. will fuel the gasoline direct injection system market size from 2016 to 2024. Automakers are striving to provide high-performance gasoline engines to meet the growing stringency of the federal fuel efficiency and greenhouse gas emission standards. Industry participants include Bosch, Continental, Delphi, Denso, Magneti Marelli, Hitachi, etc. The gasoline direct injection system market is characterized by a considerable degree of consolidation. Other key players include Stanadyne, MSR-Jebsen Technologies, Eaton Corporation, Mitsubishi Electric Corp., and Bajaj Auto Ltd. Huge R&D investments are anticipated to be the part of key strategies for establishing prominence in the industry. Introduction of advanced portfolio, incorporation of next generation technologies will help the players gain competitive edge in the gasoline direct injection system market. For instance, in February 2014, Denso announced R&D investment of USD 10 million at DENSO International America (DIAM) for the development of gasoline direct injection systems components with the purpose to improve product performance and thereby increase its GDI system market consumer base. GDI system market participants face considerable competition amongst themselves to attain overall industry share. The competition is based primarily on quality, technology, and price. Moreover, the consolidation in automotive industry can affect sales and profit margins owing to pricing pressures and pricing actions from competitors. Thus, players are focusing on foreseeing the gasoline direct injection system market development course and trying to produce similar products at lower costs over others and adapt themselves to evolving technologies for customer requirements. Threat of new entrants is high for the established players in the automotive component supplier industry, both domestically and internationally. OEMs can select suppliers having ability to manufacture products on worldwide basis and flexibility to adapt regional variations. Furthermore, rapidly evolving competition has attracted new entrants particularly in low cost countries such as China or evolving vehicle technology areas. GDI systems help in improving the driving dynamics of the automotive and the overall fuel costs over its life cycle. They also greatly contribute to reduction of polluting emissions through incorporation of turbocharging and few other downsizing concepts, with an estimated 15% reduction in fuel consumption and CO2 emissions. These attributes will support the overall GDI system market demand through viable consumer inclinations.